Help with my German Shepherd. She was having trouble walking and bald spots from chewing on herself. Q: What changes in your body and/or mine have you noticed since receiving Blu Room treatments? She stopped chewing all the fur on the back of her legs have started to grow back in and she is walking significantly better. (She had a series of 6 sessions in a week’s time). Staff is incredible – warm, compassionate, patient and helpful. Trust – Everything can be healed and rejuvenated. Anything is possible! It was a great experience seeing Andrea’s German Shepherd be able to walk with greater ease, even after their very first session, she was able to stand up with more ease and support herself better by the end of the weeks sessions Andrea was not needing to help support her coming in and out. Our hearts are filled with so much happiness to see the extent of what the Blu Room can do for everyone! 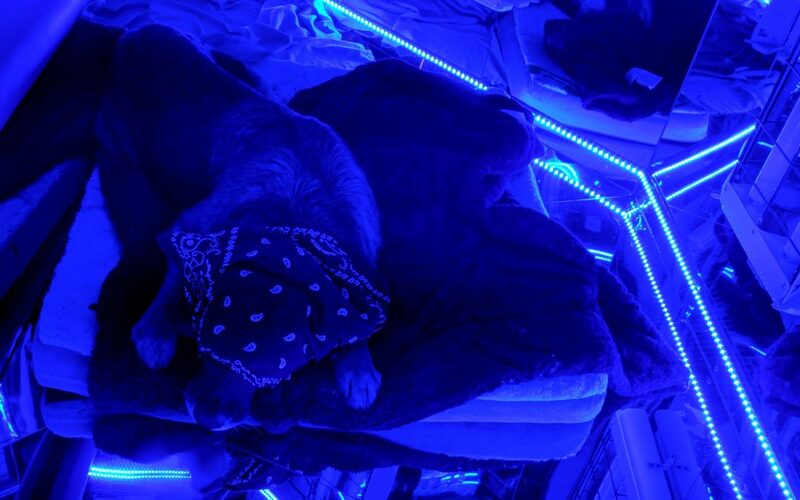 If you’re interested in bring your pet in for a Blu Room session please contact us directly at the center to discuss as well as review our pet guidelines on our FAQ page. Look forward to seeing you and your four legged family in the Blu! Is it true that Blu Room therapy is not adviceable for people suffering of skin melanomas ? Hello Martha, great question! We have had individuals with varying skin conditions including Melanoma’s, some choose to simply cover the area while receiving Blu Room treatments. Blu Room Light Therapy only uses narrowband UVB light which hospitals will even use in treating infants.. you can read more about that in an older post infant receiving light therapy. martha, i have had melanoma in the same place twice. i have had over 60 sessions in the blu room, with no ill effects. i had questions at first about the uv rays, since i have been told to stay out of the sun. i did some research on the uv rays used in the blu room and felt satisfied there was no risk. i am not sure staying out of the sun was good advice, since i was found to have a vitamin d level of 8 (should be between 30 and 50) i do feel sunshine is good for you — abuse of sun exposure not so much! i abused sunshine in my younger life and i feel that is why i have gotten melanoma and i got it a second time because all the cells were not removed with the first surgery. the second occurrence was removed with mohs surgery which is a “sure thing” to remove all the cells. after my visits to the blu room, my vitamin d level is 27. i have experienced several other benefits from the blu room.